Modern elegance well describe the stylish Heritage collection from Alf Italia. The beautiful Bed will surely be the centerpiece of your master bedroom. It features a panel style headboard with mirror accents and a platform base. It comes in an amazing dark velvet birch high gloss finish which makes this collection unique. Pair with the storage pieces to create a wonderful and timeless bedroom set for your home. The ALF Heritage Bedroom Collection by ALF Italia. This symmetrical and elegant design is crafted in beautiful dark velvet birch, and top coated with a protective high gloss finish. The accents and reveals are black nickel. Two sizes of nightstands, and two sizes of dressers, make this collection highly configurable for your bedroom. 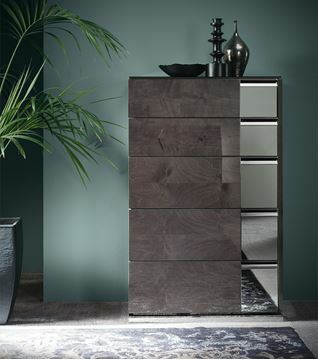 The nightstands, dresser, and tall chest feature a unique anthracite toned glass. The Heritage Bedroom Collection is a wonderful fusion of Italian design and practicality. Soft closing drawer glides complete the attention to quality and detail by which ALF is so well known for. Add the optional LED Lights for a stunning visual enhancement and enjoyment in the evening hours. The beds are designed with three hidden wooden slats that connect between the side rails, which are designed to support your box spring and mattress. Below is the finish for the ALF Heritage Collection. Please note that although these finishes are representations of finishes, the true colors may vary from those shown on your screen due to the nature of digital formatting and screen setting options. Our showroom is a great place to visit and see the finishes first hand, but we are also more than happy to send samples for you to look at as well. Modern elegance well describe the stylish Heritage Bed, part of the Heritage Bedroom Collection by Alf Italia. It features a panel style headboard with mirror accents and a platform base. It comes in a very unique dark velvet birch high gloss finish. Pair with the storage pieces to create a wonderful and timeless bedroom set for your home. Modern elegance well describe the stylish Heritage collection from Alf Italia. The beautiful Dresser offers ample convenient storage for your bedroom with its three large drawers. 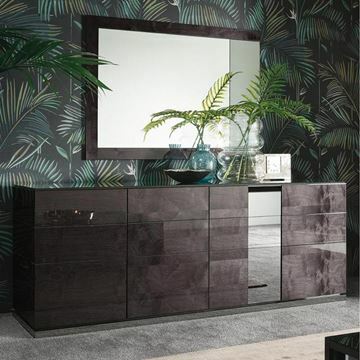 It comes in an amazing dark velvet birch high gloss finish and has mirror accents which makes this collection unique. Modern elegance well describe the stylish Heritage collection from Alf Italia. The beautiful Petite Dresser offers ample convenient storage for your bedroom with its three large drawers. 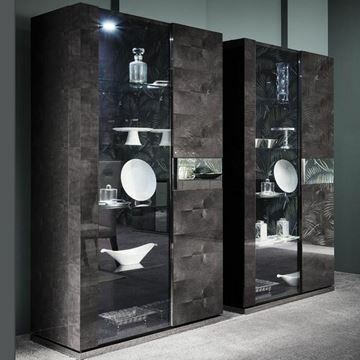 It comes in an amazing dark velvet birch high gloss finish and has mirror accents which makes this collection unique. Modern elegance well describe the stylish Heritage collection from Alf Italia. The beautiful 5 Drawer Chest offers ample convenient storage for your bedroom with its three large drawers. 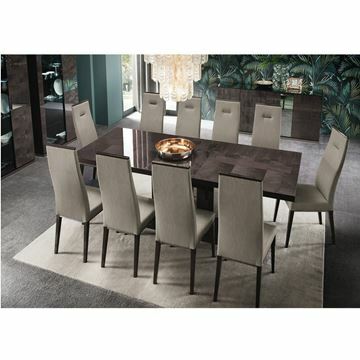 It comes in an amazing dark velvet birch high gloss finish and has mirror accents which makes this collection unique. The ALF Heritage Buffet by ALF Italia. This symmetrical and elegant design is crafted in beautiful dark velvet birch, and top coated with a protective high gloss finish. The accents and reveals are black nickel. 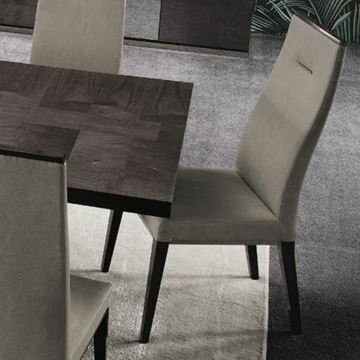 The Heritage Dining Collection is a wonderful fusion of Italian design and practicality. Soft closing door hinges complete the attention to quality and detail by which ALF is so well known for. Modern elegance well describe the stylish Heritage collection from Alf Italia. Note how the artisans laid the wood veneers in differently, so as to allow the beauty of the wood grain to play with light from different angles. 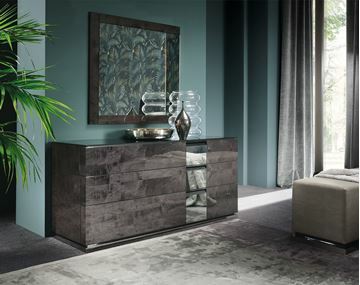 The beautiful Curio offers ample display storage behind the glass door and lighting feature. It comes in an amazing Dark Velvet finish and mirror accents which makes this collection unique. The interior of the cabinet is illuminated with a bright LED light. And both doors feature soft closing adjustable hinges. Two curio cabinets positioned side by each as shown in the photo make for a strikingly beautiful wall display. One Curio measures 41"W 21"D 75"H.
The stylish Heritage Dining Chair from Alf Italia will make a great addition to your Heritage Dining Table. The modern design features a velvet birch high gloss structure and grey ecoleather seat and back has a supple soft suede like feel. It stands on tapered legs and has tuft accents on the front and mirror accents at the bottom of the seat. The beautiful and stylish Heritage Entertainment Center, by ALF Italia. The modern design features a velvet birch high gloss structure, anthracite glass top on the center cabinet, and polished chrome accents. Two drawers in the center unit provide wonderful storage. The side glass display cabinets feature soft closing door hinges, and are illuminated with a flush mounted brilliant LED light.